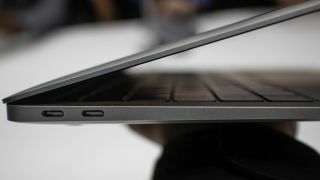 The MacBook Air (2018) has not been in the hands of the public for long – it went on sale November 7 – but Apple has already seen fit to release a supplemental update for its macOS 10.14.1 operating system specifically for the new laptop. The update is called “macOS Mojave 10.14.1 Supplemental Update for MacBook Air (2018)” and can be downloaded right now. This shouldn’t be confused with the macOS Mojave 10.14.1 update, which Apple released at the end of October, and is already installed on the MacBook Air (2018). It may be a bit annoying to have to download an update as soon as you get your new MacBook Air, but it’s worth installing the Supplemental Update as soon as possible. We’ve been using the MacBook Air (2018) for our upcoming review, and while we’ve not encountered major issues, it has crashed on us once, right at the start of our tests, so hopefully the update will prevent any similar problems. To download the update, open up System Preferences, then click on ‘Software Update’. The update should be waiting to be installed. The update is 1.46GB, so you may want to make sure you’re not on a metered connection, and it also suggests it’s a reasonably substantial update.